This is from the layby opposite the coal yard, looking over Loch Indaal towards Bowmore. 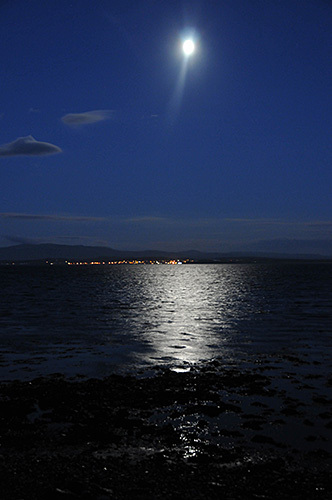 The very bright full Moon overhead, illuminating Loch Indaal and the sky. The lights are of course Bowmore. The Moon is unfortunately a bit blown out and far too bright, I still have to learn how to get that right. Exposing the Moon correctly while not underexposing the rest of the scene. One day I'll figure it out. That's all for tonight, time to get some sleep, have a great weekend and good night! More tomorrow.